The Rainbow plant is a beautiful and delicate carnivorous plant with elegant flowers and sparkling leaves that shimmer in the sunlight. 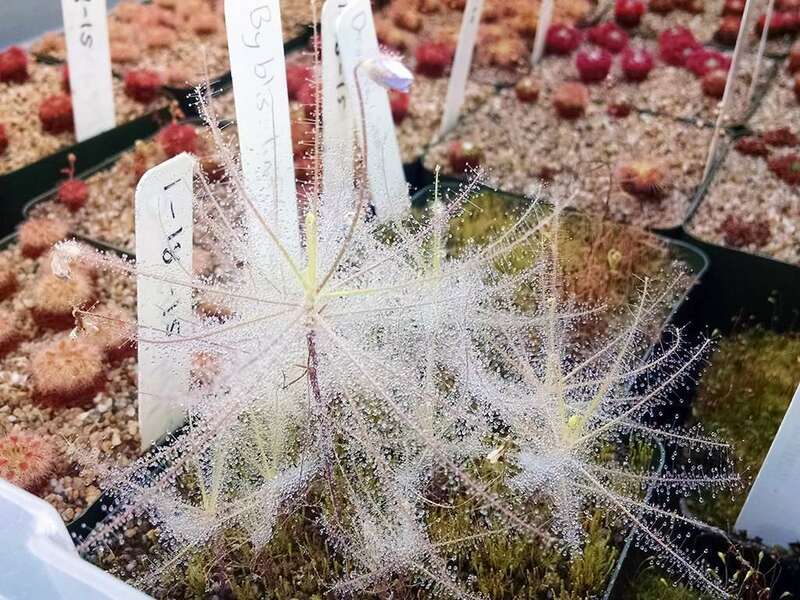 Don’t confuse them for Sundews, though, as they are a unique species and more closely related to Butterworts, sharing similar digestive glands, and flower structure. They grow branching, narrow stems around which linear leaves protrude. Dainty flowers are sprinkled among these carnivorous tentacles – I guess the Byblis doesn’t mind munching on its pollinators. Conveniently, there are also seven documented species – one for every color of the rainbow! The leaves have two distinct types of glands – one that secrets a shimmering glue to lure and ensnare insects. Mosquito and gnats don’t stand a chance – they land on a droplet, expecting a tasty snack, but instead get stuck. As they struggle, they come into contact with more glue, and eventually die from exhaustion or suffocation. At this point, the second digestive glands comes into play. These sessile digestive glands are scattered along, and lay flat against, the leaf surface. Like with most carnivorous plants, the digestive enzymes dissolve the insect’s soft tissues. There’s also a suspected symbiotic relationship at play with Rainbow plants. Similar to the Dewy Pine, Byblis plays host to assassin bugs, which seem immune to the sticky secretion. The plant reels in the prey, the assassin bug eats it, poops on and around the plant, and the plant absorbs the nutrients from this secretion. Yum! Rainbow plants have narrow stems that can branch and vine along the ground with certain species. Some Byblis are perennial, thriving for years-to-decades, while others are annual species, dying back each season. Size varies from 1-2 foot bushes of sticky insect nightmare glue to dainty wisps of unsuspecting death. If you’re a bug, don’t worry – you’re doomed either way. The two known Byblis perennials are B. lamellata and B. gigantea and hail from southwestern Australia. They enjoy a Mediterranean climate with dry, hot summers, and wet, cold winters.Fascinatingly, Byblis seeds require fire to germinate. In their natural habitat, fast-moving brushfires roll through and chemically condition seeds to sprout once the rains of autumn begin. Sometimes seeds wait years before a fire preps them for growth. 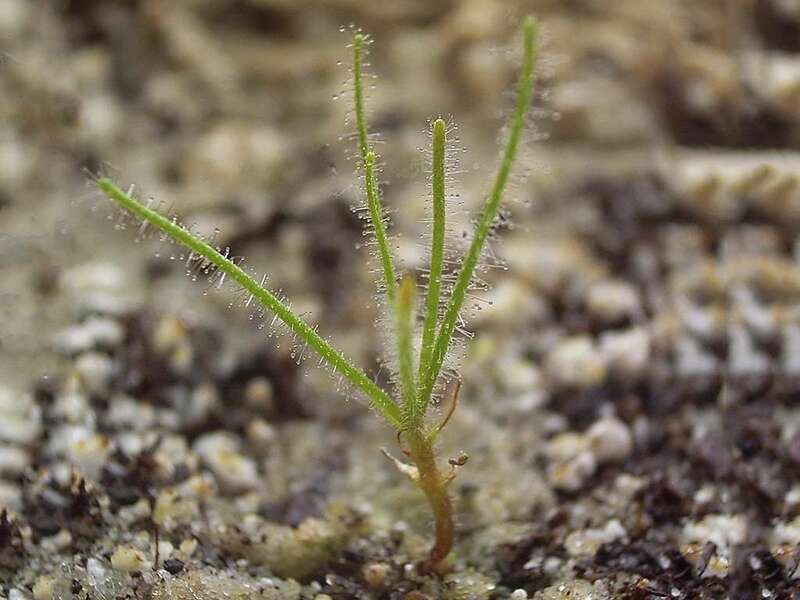 This can cause an accumulation of seeds, and hundreds of plants sprouting after a dry period of brushfires.Seedlings grow quickly, and can flower as soon as the following spring. They send roots deep into sandy soils, and produce woody stems from which their delicate leaves unfurl. The plants die back to this stem during dry summers and enter a dormancy. This dormancy, however, is not required in cultivation, and the plants will even grow year-round in natural habitats that remain moist during the summer. Annuals execute their full life cycle, from seed to flower, during a single growing season. They completely die every year. This is not a dormancy, but a full-stop end-of-life cycle. Only seeds bridge the gap from one season to the next.Annual Byblis include B. aquatica, B. guehoi, B. filifolia, B. liniflora, and B. rorida. Climate is warm and tropical year-round with drier winters and monsoonal wet summers. Annual Rainbow plants enjoy sandy soils near streams. Seeds germinate and grow incredibly fast in the warm rains. Plants will sometimes flower within weeks of germination. Sprinkled among the carnivorous leaves of Byblis, you’ll find beautiful flowers of white or pink. The flowers of B. aquatica and B. liniflora frequently self-pollinate upon closing, but it never hurts to tease them with a paintbrush to assure solid seed set. Seed pods will brown and split open with around two dozen seeds within a few weeks. Most Byblis species need more coaxing, requiring pollen to by crossed with the flower of a different plant that is also a genetic clone. This conjures deep philosophical questions – like if you pollinate your clone, can that be considered self-pollination? Is your offspring also your niece/nephew? If your clone clones itself, is that clone your sibling? These are the things keep me up at night, folks. But I digress. If you have two seed-grown plants from the same parent, you can cross-pollinate these. Almost all Byblis have fascinating germination requirements, involving fire – see below for Byblis seed germination techniques. 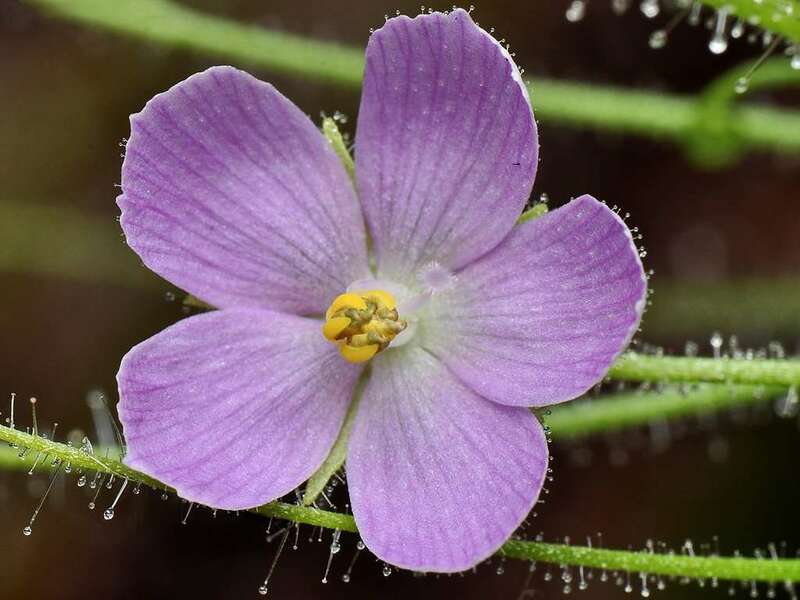 Byblis specimens were identified on a few independent occasions from the 1780’s through the 1800’s by Australian botanist James Drummond and via naturalists aboard Cook’s voyages. Throughout these journeys and for over a century after, Byblis gigantea and B. liniflora were the only acknowledged species of rainbow plants. It took Allen Lowrie until the end of the 20th century to separate the only two accepted species into seven. The distinctions in species were determined, primarily, by the differences in flower structure. 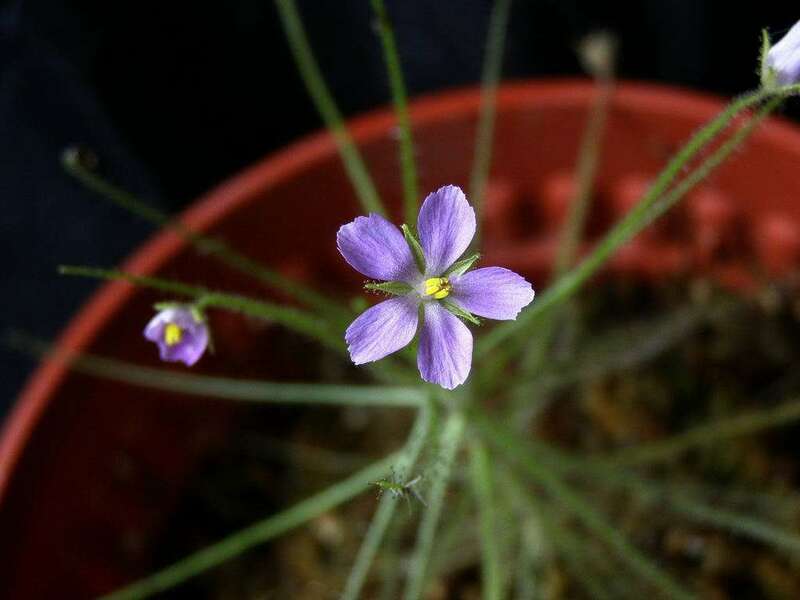 The name Byblis originates from Greek mythology wherein Byblis, the granddaughter of the god Apollo fell in love with her own twin brother, Caunus. When Caunus rejected her, she wept so many sparkling tears of sorrow, that she eventually turned into a bubbling spring. Byblis are native to southwestern Australia, and the tropical regions of northern Australia and southern New Guinea. Due to the conditions of their natural habitats, and the seasonal fires that sweep the areas, many rainbow plant species actually require fire for their seeds to germinate. More on that, below under the “Seed” section. Do your part to preserve these wonderful plants in the wild by purchasing from reputable retailers who cultivate in greenhouses. All rainbow plants enjoy a mix of one part peat to two parts horticultural sand . You can try adding one additional part of pumice , perlite , or lava rock . 6″ to 10″ pots work well for the perennial Bylis. 4 inch to six 6 inch, drained plastic pots or glazed ceramics work well for annual species. Plastic works well, but be careful if you’re using fire to germinate the seeds – you could melt your pots! Glazed ceramics make a good alternative and avoid melting issues.Use the water tray method and let pooling water evaporate in-between waterings. Maintain damp, not waterlogged soil unless you’re growing a water-happy Byblis aquatica. Use distilled or reverse osmosis water. This can be inexpensively purchased in most grocery stores, or you can invest in a reverse osmosis (RO) filtration system that hooks up to a sink (bonus – this also provides great drinking water for humans and pets). Keep the plant in a water tray and allow water to evaporate in-between waterings. Most rainbow plants will happily accept fruit flies and gnats. Outdoors, they do a good job of catching their own prey. 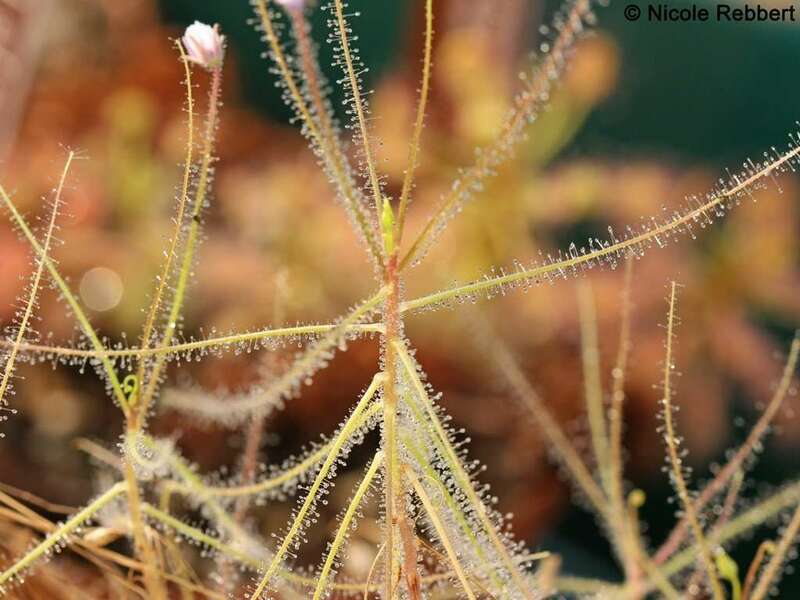 As a reminder – these plants grow naturally in nutrient poor soils – a major reason why they evolved sticky traps to catch insects as a source of nutrients. Fertilizing isn’t necessary as long as the plants are fed insects, but a monthly foliar feeding with Maxsea fertilizer will encourage healthy growth. Avoid transplanting annual Byblis species – it can shock and kill them. Simply make sure to sew their seeds in what will be their permanent home for the year.Perennials can be transplanted if they outgrow an existing pot. Carefully remove them from the soil and try to avoid spilling too much dirt on the sticky carnivorous leaves. Soak the root system in vitamin B1 to reduce the shock of uprooting before planting into their new home. Byblis lamellata and B. gigantea will produce offshoots that you can divide and replant. Remove a plant from it’s soil and observe the woody rhizome from which the growth points emerge. If there are multiple growth points with supporting roots, you can separate these using a sharp knife. Cut through the rhizome, soak the new plant in vitamin B1 to reduce stress, and repot. Leaf cuttings won’t work with Byblis, but root cuttings are a good means of propagation. Attempt this while transplanting or dividing the parent plant. Simply find the oldest and thickest roots and cut them into 2 inch sections. Place the cuttings onto their preferred soil mix, and cover with about a quarter inch of soil. Use a propagation tray to keep the roots humid, and damp and place in bright light. Within several weeks, you’ll have sprouting plantlets. 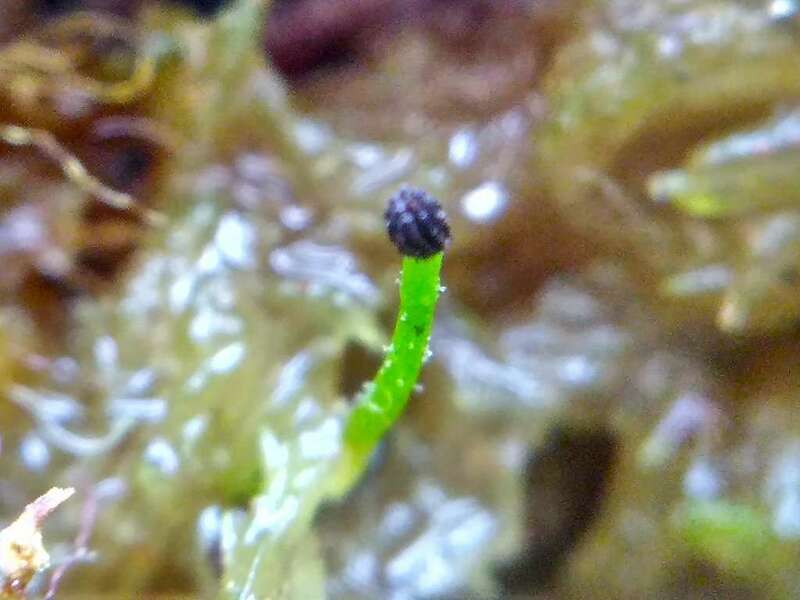 Byblis seed have evolved to require some special care. All species except for B. liniflora will require fire or smoke exposure to chemically condition seeds for germination. It is believed that the smoke, not heat exposure, is what triggers germination. In native Byblis habitats, exposure to fire happens during fast-moving brush fires. The fires are seasonal, but sometimes years go by without them. This means that multiple year’s worth of Byblis seeds can stockpile until a fire finally triggers hundreds or thousands of them to sprout simultaneously.In cultivation, you’ll need to mimic exposure to smoke for seed germination.Method 1 – Light a small fire: Lightly press seeds onto the damp surface of the soil you will grow them in. Moist soil will prevent over-exposure to heat. The pot you use should be clay or ceramic, and not melt-happy plastic. Position torn paper towels, hay, or dried grass over the top of the seeds, and light with a match. Softly blow on the small fire to get it burning well and ensure that the seeds beneath get a good dose of smoke. Once the fire burns itself out, allow the surface to cool, dust off the ash, and water. You’ll have baby rainbow plants in a few weeks.Method 2 – Light a cigarette: Sow the seed as you would using the above method, and place a burning cigarette on the soil next to them. Cover the pot with a plastic bag to hold in the smoke. The cigarette will quickly burn itself out, and you can leave the bag over the pot until the smoke inside clears.Method 3 – Liquid smoke: This is the most delicious method known to germinate a carnivorous plant. Liquid smoke can be picked up here, or at most grocery stores, and is a type of seasoning used to flavor barbecue and other tasty food. Pour some of this in a small bowl, and soak your Byblis seeds in it for 15-20 minutes. Transfer directly to preferred soil. 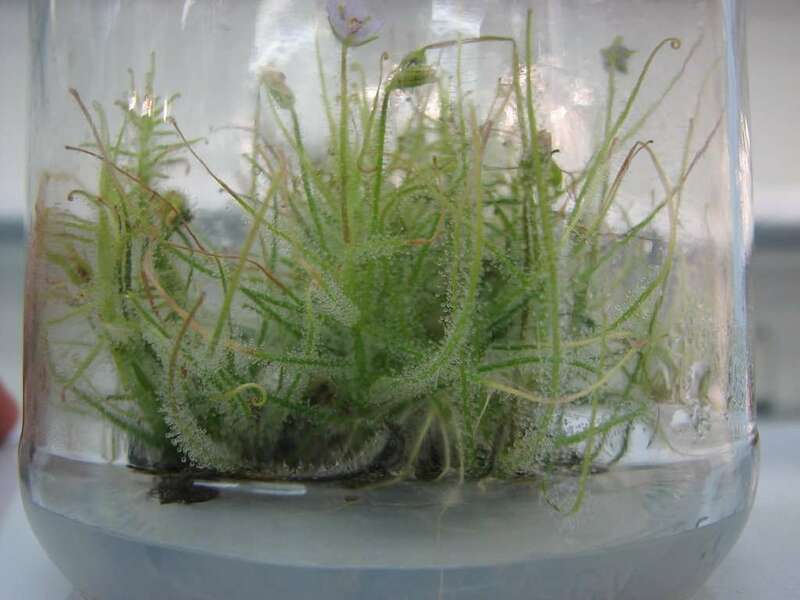 Byblis can be tissue cultured via sterilized seed. Damp-off fungus attacking seedlings is the most prominent Byblis pest, and can be easily treated with a fungicide. Slugs and snails will also snack on plantlets, so watch out.Rarely, aphids or mealybugs can attack perennial species. Treat with a pesticide. Perennial Byblis enjoy Mediterranean or subtropical climates free of frost. Cool nights are preferred.Annual Byblis species thrive in tropical climates, and due to their short growing season, can be grown anytime over the course of several warm months. Again, perennial Byblis enjoy Mediterranean or subtropical climates free of frost. Cool nights are preferred. If your region meets these conditions, you can grow them outdoors in partial to full sun. 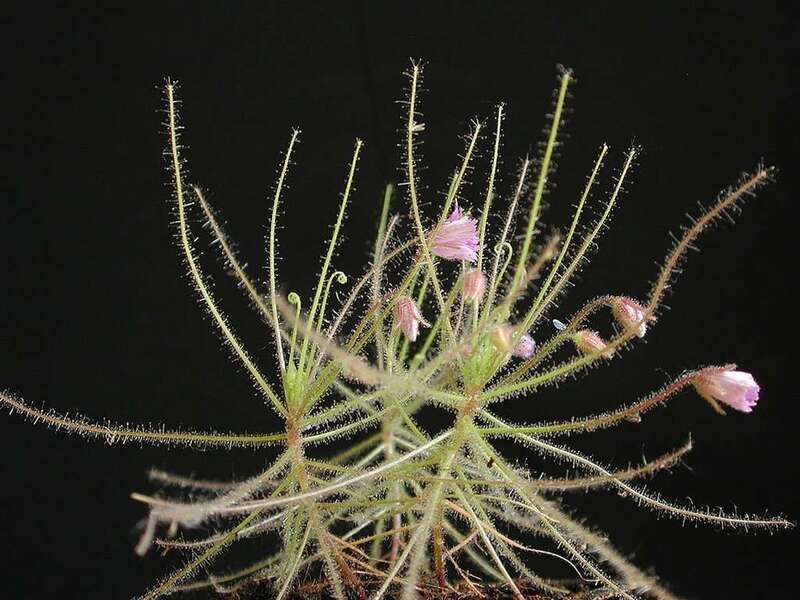 They’ll also survive in warm temperate conditions.Annual Byblis species thrive in tropical climates, and due to their short growing season, can be grown anytime over the course of several warm months – including outdoors. Annuals thrive in stove houses, hothouses, and warm houses. Perennials do well in cool and warm greenhouses. Large species like Byblis filifolia will outgrow terrariums, and may be better grown outside of terrariums under bright grow lights . Smaller annuals, like B. liniflora, will thrive in warm terrariums under the same lights.Larger perennial species are also best grown outside of terrariums because of their size, and preference for cooler nights. It’s possible, but you’ll need extremely sunny windowsills for species like B. liniflora to flourish. Rainbow plants are good candidates for the higher portions of bog gardens, where soil stays damp and not waterlogged. Respect temperature and light requirements, and avoid frost and freezes.